The Robyn's Nest: Cooper - 16 Months Old! Clothes: Completely in 18 and 24 month clothes. 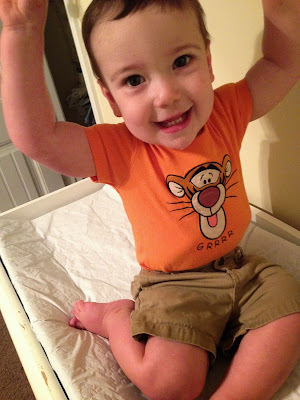 12 month clothes are officially too small for him. Shoes: 5 1/2 or 6 and WIDE! Cooper is FINALLY down to only one nap a day. He still sometimes gets fussy during what would have been his morning nap, but overall he's adjusted. Now that he's only down to one nap, I'm loving the freedom that we have as a family! Teeth: Cooper's top molars finished coming all the way through this month. His bottom molars haven't busted through yet, but they are soooo close. 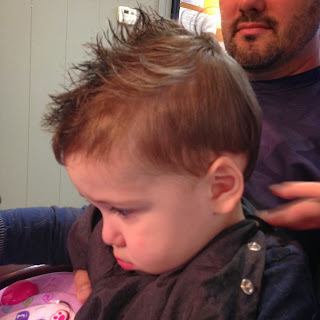 They have made him pretty miserable this month and we are ready for them to be OUT! They have made him pretty cranky, and he is drooling everywhere. His tooth count is at 10, and I'm pretty sure it'll be at least at 12 by next month. 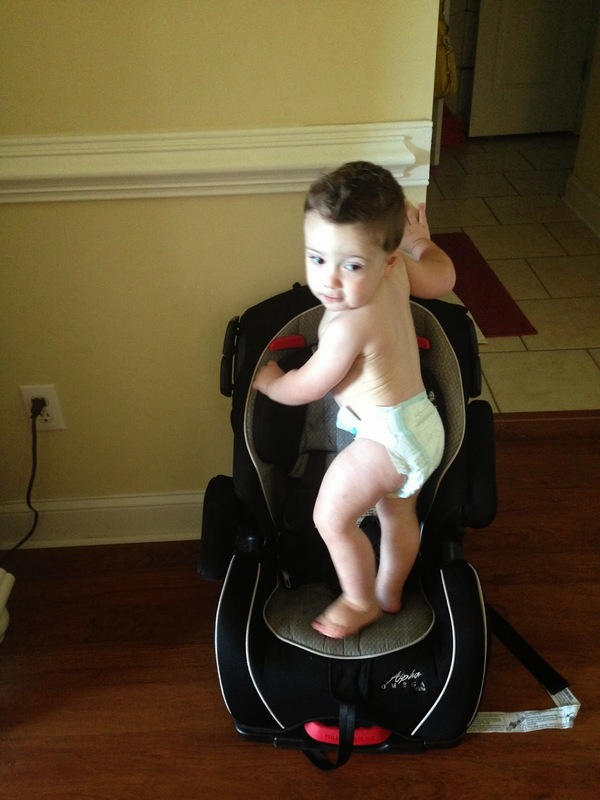 Walking: Cooper started walking last month and now it seems like he is a pro at it!! He is doing fantastic at it and is just getting faster and faster. He can't run yet, but he can move pretty quickly. 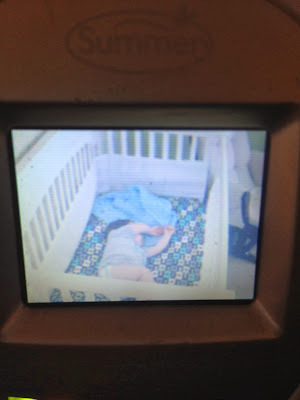 He's also losing a lot of that "monster walk" where he holds his hands out or up to steady himself. He's also a pro and bending down, squatting, etc. I am enjoying him being able to walk so much. I love it! Talking: Last month, Cooper only added one word to his vocabulary. This month, he added three: eggs, Gigi, and night-night. The really frustrating thing is that he'll learn a new word, say it a few times, and then refuse to say it anymore. He said "eggs" for about 2 days and now we can't get him to say it again. Same thing with "night-night". He said it one night as clear as day (after I asked him to say it), but now he won't say it anymore. He has said Gigi a good bit over this month, so at least he's hanging on to that! His most often said word is for sure "Dada". He says it pretty much all of the time. He also started quacking for a duck this month when you asked him to. He also started signing "more" this month - even on his own instead of just when we asked him to. I love it! 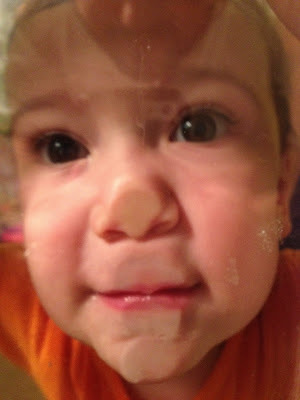 Body Parts: Cooper has been doing great with identifying body parts. He knows where eyes are, but will only point to other people's - not his own. He will point to his own belly (he actually points to his chest - haha), he will show his teeth if you ask him where they are, and he will touch his legs if you ask. 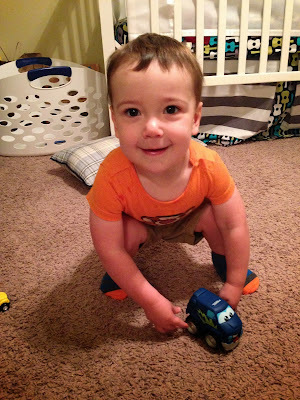 Vehicles: I mentioned it a little bit last month, but over this past month, Coop has become obsessed with vehicles. He loves to play with them and they are his favorite toys FOR SURE. I took him to LL's gymnastics lesson one week (by myself! FAIL!) and didn't pack him any cars or trucks. Several other boys there were playing with their own cars or trucks and Cooper was NOT happy! I spent the entire hour trying to keep him entertained and happy and not trying to take another boy's cars. 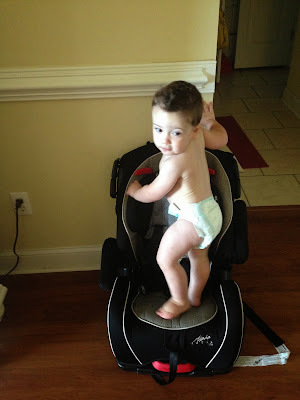 Needless to say, there will always be a car in the diaper bag from now on! 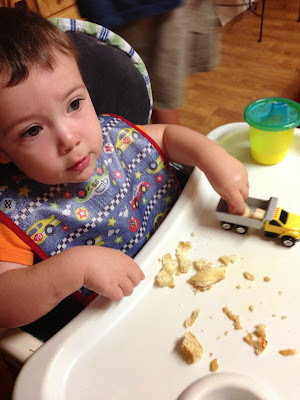 Sharing his pancake with his dump truck. Clean up: Cooper has started to help clean up this month. When we sing the clean-up song, he knows what to do and will start putting toys in his basket. He's pretty slow about it (he'll hold a toy and think about it for a looong time before he puts it in), but at least he's helping! He will also "clean" his tray at Grammy and Pop's after he eats. If you give him a wash cloth, he'll wipe it down when he's done. Coop also loves to put things in and out of baskets, buckets, boxes, etc. He'll spend forever putting things in, dumping them out, and then putting them back in again. On demand: Cooper has started to do lots of things when you ask him to. In addition to pointing to body parts, he will cough and clap when you ask him to. I'm also trying to work on "say cheese!" to get a smile, but we're not quite there yet. Sickness: We've been quite a while without Coop getting sick (since this summer), so I should have known it was coming. 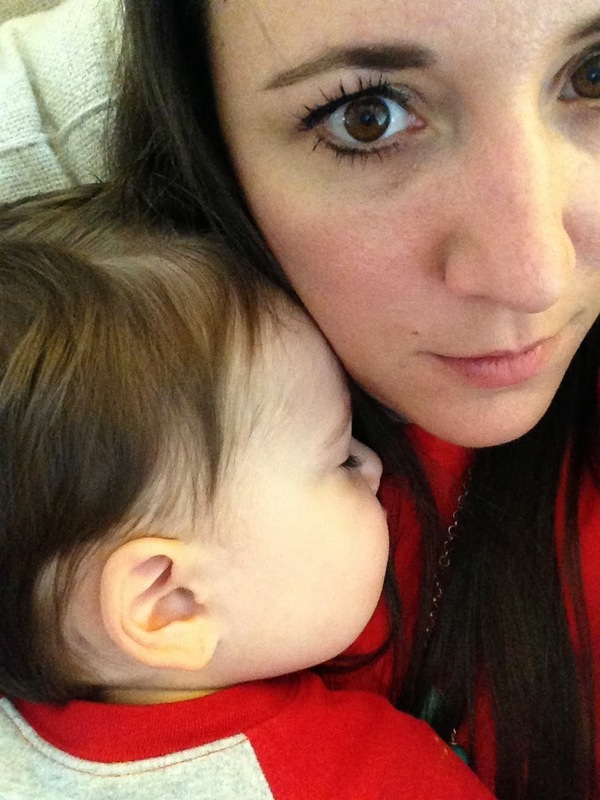 Randomly one night he puked pretty big, but we chalked it up to his acid reflux. Then about 30 minutes later he started throwing up and it just kept getting worse. We took him to a walk-in clinic and they gave him some meds to stop the vomiting. He threw up a few more times that night, but has been fine ever since. Thank God! 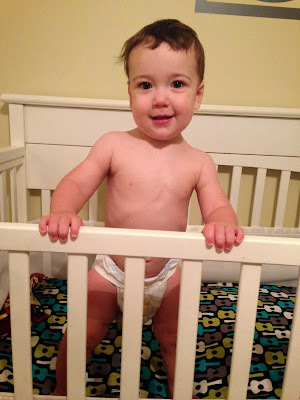 Independent: Coop is still a very laid back baby, but he is now getting to be VERY independent! He wants to do everything on his own and really doesn't like to be held anymore. He has his own ideas about things and has places to go! It's so neat to see him start to really figure out who he is instead of just being a tiny baby! 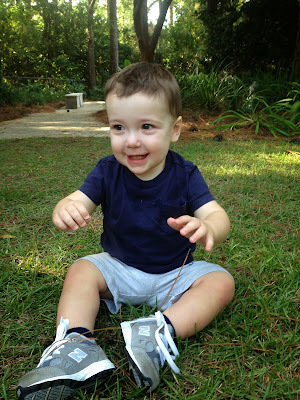 He is all boy and into everything! They're building houses across the street from us. He is obsessed with watching them! Holding a truck and watching construction, of course. 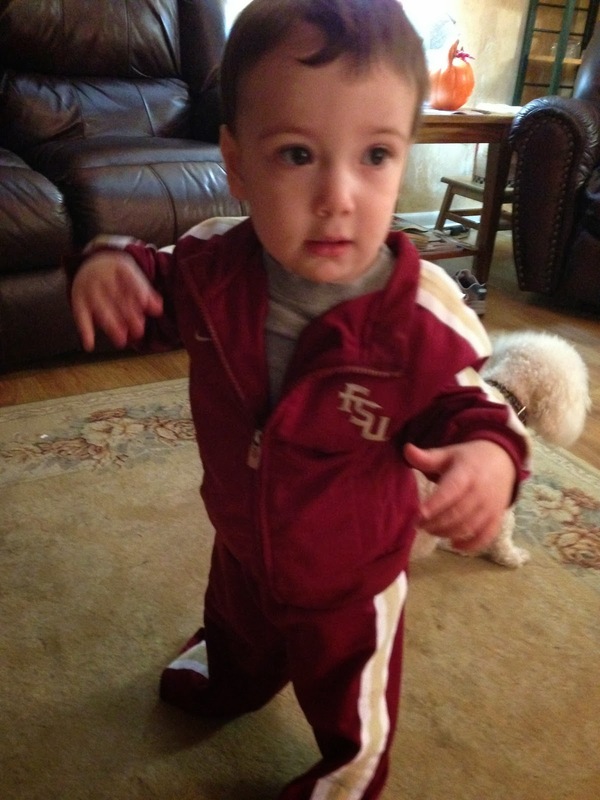 16 months and rocking the FSU gear! Go Noles! 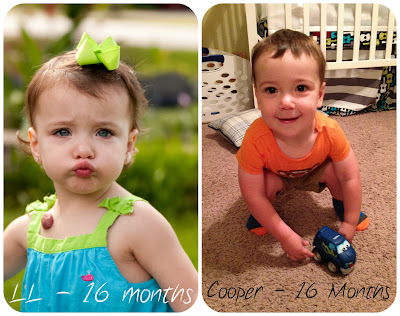 Both kiddos at 16 months!